Been meaning to talk about this for a while now – have found it very exciting, and of obvious value for classroom use. We’ve had a lot of fun on our SMART Board with this. Basically, what we’re talking about is a weather map with weather symbols on it, just like you see on the TV weather forecasts, but located on a web page. Sounds pretty dull, eh? But that’s where the genius starts. This isn’t some remote, static weather map that all you can do is look at it. This weather map relies on YOU to tell it what the weather is like. Initially, the only way to send information to the map was from a Twitter account. By tweeting following the format #weather_me <location>, <weather keyword>, <comments> you could send your real-time weather info to the map. And that was good. The format was fairly precise to follow. A misplaced comma or using a non-keyword to describe the weather, and all your good work was undone. During the last week of term, I used my Twitter network to try and cover the map in real-time weather info that they had supplied, and to a certain extent we succeeded. The only problem was that many of the tweets weren’t correctly formatted, and although I could see and understand them they weren’t recognised by the site. ReTweeting them provided a quick work around, and we certainly managed to cover the map in symbols (mostly sunny ones as I remember), but the downside of that, as pointed out by Kenny, was that I looked like I had colonised the whole of the British Isles. Given that the Tweet on the map that my class were most interested in was their own, this would have taken away somewhat from other classes who had Tweeted weather, and also prevented my class from finding out about other people who had been Tweeting from looking at the map itself. Also, it meant that people HAD to have a Twitter account to use the site, which given the blocking issues in schools could sometimes be too much to ask for. Fortunately, the extremely technically gifted Matthew Tullett from twelve20 was watching and learning. He tweaked the site in a number of ways, including the ability to send the weather from the site itself. This opened it up to anyone to use, not just the Twitterati. As long as you have a location/postcode and an internet connection you can use the site. 2 – Some of the symbols are difficult to see against the map – maybe make them a different colour, or give them an outline, or make the map a different colour? Small tweaks I am sure you would agree. Go on – try it here now (you are looking for the “you can add to map here” link on the right hand side). And it’s not just users in the UK, the map can go global too just zoom out. For those of you who are only here for the SMART Table lowdown, I’ll apologise now. In fact, you can skip this whole post, and I won’t even be slightly offended. This post is not about our SMART Table, it’s about something that we have had for longer, and which I hadn’t even thought about blogging about until last week. A Twitter account, specifically the Twitter account that I set up for my class. One evening last week, can’t quite remember which, I ended up fielding quite a few questions about my class Twitter account (on Twitter, naturally enough…) and figured it might make some sense to do a quick blog about it. So here goes! I had been thinking of setting up a class blog for a while, but was becoming increasingly frustrated with the very negative response I kept getting – specifically that “anyone could see it”. Whilst I had thought that was the whole point, I hadn’t realised how protective we had become, and the class blog is on hold, for now. In a daring compromise manoeuvre, I managed to get permission to set up a class Twitter account providing the updates were protected. Figuring it was a step in the right direction, and as such a good start, I agreed, and @IMSLewis was born. Originally, I had intended to use this as a way to keep parents in touch with what was going on in class as well as giving the pupils an insight into social netwworking in a reasonably secure environment. I had hoped that other classes in the school might be interested in Tweeting too, and that we could connect with each other over our 3 campuses. 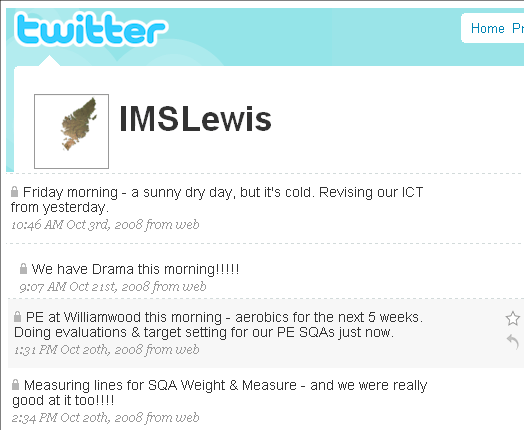 In my more ambitious moments, I even pictured an @IMSchool or @IsobelMair account that could ‘follow’ all the other classes, providing an aggregated Tweet-feed that might be an almost real-time school blog. After all, everyone would rush to embrace this new technology, right? I’m still a bit shocked by this one. Without going into too many details, let’s just say that the response was ‘lukewarm’. I don’t know if it was because as a protected updater, parents would have to jump through a few hoops to follow us, or if the response would have been similar had we been ‘open’. The parents who did sign up were soon interacting with the class, and benefits could be seen, but overall this has been a disappointing area of the Twitter experiment. As a ‘social networking’ site, Twitter has fallen foul of our Net-Nanny (Hello Websense!!!!) on a number of occasions. Annoying, particular when you are trying to establish the use of the site as part of the class routine. We have also encountered some ICT issues with faulty laptops, intermittent web access and the like which has impacted on our ability to use the site as we would have liked, particularly recently when our Tweeting has almost dried up. However, any new initiative is likely to suffer similar teething problems, and I am glad to say they haven’t managed to kill us off just yet! Whilst we were suffering access issues, some of our intended partners were suffering similar, or even worse, problems; in 2 cases these proved insurmountable and they had to pull out of our project. If I was shocked by the (lack of) parental response, I was stunned by the response from other educators, many of whom were very interested in what we were trying to do. Special mention must go to Ollie Bray, who agreed to link up with the class through Twitter as they worked on their rain forest topic. The class really enjoyed being in touch with Ollie as he provided an ‘expert’ voice on their topic, and his assistance in discovering tree-kangaroos was invaluable! The sense of connection that the class got from communicating with someone as they travelled around Europe was also very worthwhile. On a school trip to Amazonia, through the medium of mobile phone technology, the class stumbled onto a brilliant discovery – they could tweet from anywhere, making it an instant way of recording thoughts/events. It was also a handy distraction at some fraught times for some of the pupils, the familiarity of ‘updating our Twitter page’ helped calm some overexcited pupils! Our most recent discovery, one that helped us share our rainforest artwork, was that sending pictures of things by Twitter can be FUN (providing you are careful about the pictures sent….). Overall, whilst the Twitter experiment has not quite panned out the way I had originally hoped, it has been very worthwhile. The pupils have been quite taken with it, and in at least one case it has been able to engage a child at home in a way that has not been possible previously. The directions the Twitter account has taken itself in have been most valuable, and have offered up another range of possibilities for investigation. Parents have now been asking how to follow us, so our audience is expanding, and starting to feature more of our original ‘target’ audience. And the ideas continue to flow. Shall we follow the astronaut-Tweeter? With almost all of our parents now supplying an e-mail address, perhaps I could set up accounts for them and remove an obstacle to their participation?